This document describes the methodology used in fitting, and wiring the BA Fairmont Analogue clock, to BA models that do not have this option. NOTE : On models where the clock was not originally fitted, there will be no factory wiring connector available, and will need to be added for the clock to function. The method used to remove the upper triangular trim is the same for both removing the standard trim, and for removing the clock module. The trim is held in to place by 2 Large plastic clips, (The same clips used to hold the Auto Transmission shift shroud in place). These clips take quite an amount of force to disengage, and although are very sturdy, care MUST be taken when removing this plastic, as to not damage or scratch the Instrument crash pad, and the Vents below. These clips are located at the back of the Plastic trim, roughly 1cm inwards from each side. The best method to remove the trim is to use a small, thin Flat headed screw driver, and positioning it at the back, between the Instrument crash pad, and the plastic trim, roughly 1cm away from the corner of the trim. This will position the screwdriver roughly behind the plastic clip. Once the screwdriver is in place, CAREFULLY lever the plastic triangular trim upwards, taking extra care as to not damage the surrounding crash pad surface. Once you have the first clip disengaged, use the same technique for the second clip. Once both clips have been removed, the triangular trim will simply swing upwards, as shown above, and the lower clips will disengage. What you will have left is something similar to the image below. From the above picture, you can JUST see the 2 holes used for the mounting clips that hold the plastic trim in place. When removing the trim, the optimal screwdriver position is just behind these 2 holes, in order to gain the most leverage from the screwdriver, on to these clips. Please NOTE : Although it may be possible that Premium Sound optioned vehicles "MAY" have the analogue clock wiring connector available, it is extremely doubtful, meaning that you will need to run 4 new wires from the instrument cluster, to the Clock, in order for the clock to function correctly. 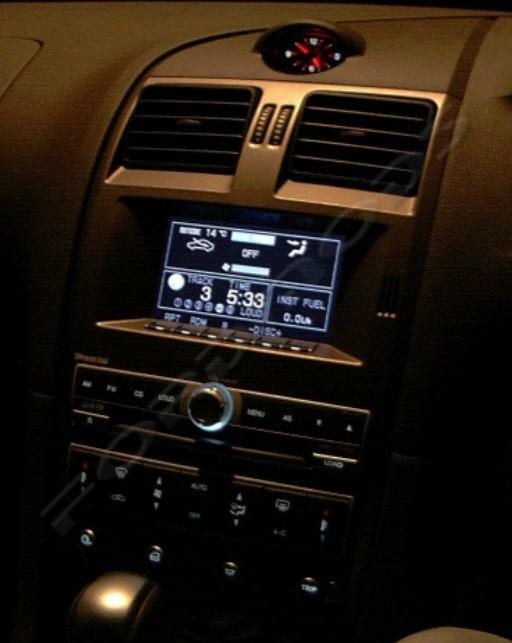 The above image was taken from a BA Fairmont Ghia, which already had the analogue clock system factory installed. The Analogue clock requires 4 wires to be added, in order for the clock to function correctly. Park lamps Illumination - This line is used to Illuminate the Clock when the Headlamps are turned On. Negative Dimmer Line - This line feeds Ground to the Illumination circuit, and is used to Dim the Clock Illumination, when the instrument cluster dimmer switches are used. Given the Clocks close proximity to the Instrument cluster, and the ease in which the instrument cluster can be removed, it is recommended that the wiring connections required for the clock module, are made/spliced in to the instrument cluster wiring. If this is not suitable, then it is recommended that wire connections be made to the Main wiring harness connectors, located behind the drivers/passenger kick panels. For this exercise, information will be given on how to wire/splice the required wiring for the clock module, to the Instrument cluster wiring. This line can be obtained from any wire that is used to carry +12 Volts from the battery, to a device. Taking the Instrument cluster wiring as an example, power can be obtained from the 20 Pin Instrument Cluster Wiring connector. 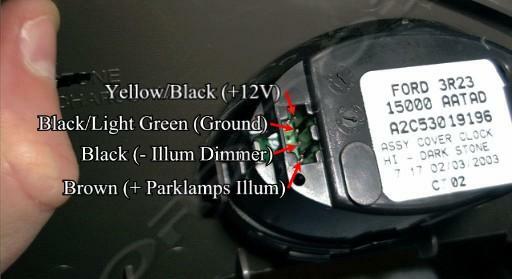 Pin 16, Wire Colour Black/Orange. This line can be obtained from any wire that is used to carry Ground (0 Volts) from the battery, to a device. Pin 6, Wire Colour Black. This line can be obtained from any wire that is used to carry the park lamps signal, to a device. This line is used to Illuminate both the park lamps, and the Interior Instrument cluster, Buttons, and Gear selector. Pin 10, Wire Colour Brown. This line can be obtained from any wire that is used to carry the interior Illumination Dimmer Signal, to a device. NOTE : This line is used to supply the Ground voltage, via a resistor, for the Illumination circuit, therefore for the dimming feature to work, it must be connected. If Dimming is not required, then simply connect this line to ground. Pin 19, Wire Colour Light Blue / Red. The following is the Pin outs used on the 20 Pin Instrument Cluster wiring connector. Note that Pins 5 and 20 have no wires coming from them - further aiding pin identification. Once these extra wires have been spliced in to the Instrument Cluster wiring loom, the next step is to then connect these wires to the Analogue clock module. There are a number of ways in which this can be achieved, and possibly the nicest solution is to use a P.C. Audio Card Audio connector. Audio cards such as sound blasters come with a wiring connector which is very similar to the connector found on the Analogue clock module. It is four pin, and has the release tab in the exact same position, and is therefore a perfect candidate for connecting to the Analogue clock module. An alternative to this is to use a 4 Pin SIL header connector, or simply solder the leads directly on to the clock module. The following diagram will further explain what pins are connected to what lines. Once these connections have been made, test the functionality of the clock module by depressing one of the 2 SET buttons on its face. If the Minutes needle moves, then the Clock is obtaining power. The next functional test involves switch the Park Lamps on, and determining if the Clock Module Illuminates. If this is the case, then the clock Module wiring is good. If no Illumination is present, check both the Park Lamps line, and the negative dimmer line for correct wiring. Once you are happy that the clock module is functioning correctly, simply engage the lower clips on the Centre vents, and push the back of the clock module downwards, to engage the 2 mounting clips. Following the above suggestions that the wiring for the clock module should be spliced in to the Instrument Cluster wiring connector, the following information details how to remove the Instrument cluster from the vehicle, to obtain access to the wiring connectors. The Instrument Cluster is held in place with 5 Phillips head screws. 3 Screws are located above the Instrument Cluster, and are clearly visible. 2 Screws are located behind the rubber dress piece, located above the steering column. 1) Position the steering column to its lowest position. 2) Disengage the rubber dress piece above the steering column, by pulling it outwards from the top of the rubber piece. There will be a total of four tabs holding the rubber piece in place. 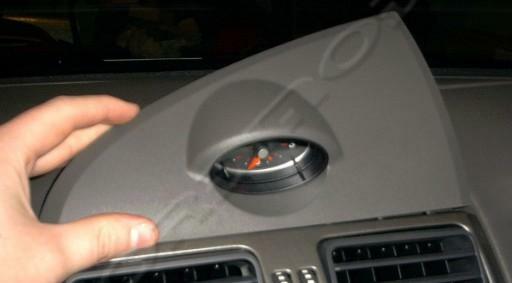 3) with the upper part of the rubber piece disconnected, the 2 Instrument cluster screws will be clearly visible. The following picture will give you a better idea of where these screws are located. 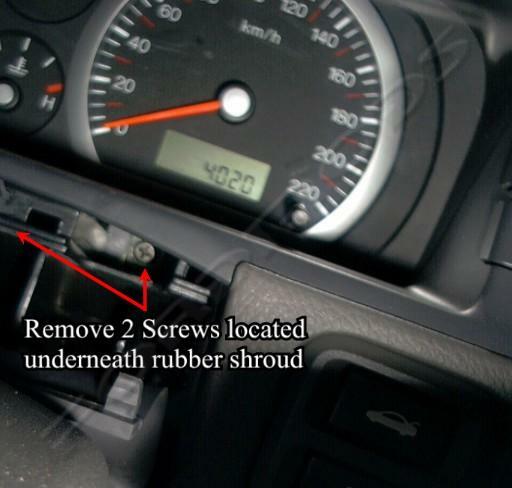 4) with these screws removed, proceed to remove the 3 upper Instrument cluster screws, located above the cluster. 5) Finally the instrument cluster can be removed. Simply pull the cluster outwards, and disengage the 2 wiring connectors from the back of the cluster. Re-Installing the Instrument Cluster is simply a reversal of the above procedure.